Now, you can award negative points that will make a different sound and subtract points away from a student, but we are a PBIS school and choose to reward positive behaviors instead. But it's there should you choose to use it. I will add that, at times, you might not want the audible tone, so you can turn that feature off or just turn the volume down. At the end of the day or week, I reward the students with the most points or the students who met their behavioral goal (great for point charts or behavioral IEPs). It truly works! You can also print behavior reports daily or weekly to send home to parents. Instant documentation! I have had this on my blog list to blog about forever ago and never got around to it, but the email I received this morning told me, "Jamie, you've got to share this!" Class Dojo just got even better! You can now use Class Dojo to keep track of and take attendance. The students (or you) can take attendance using this website and print the attendance reports with the behavior reports. Awesome! If you have any questions about how Class Dojo works, feel free to leave a comment below OR if you have used Dojo and think it ROCKS like I do, leave a comment telling me how you've used it in your classroom. FYI: I have no connection to Class Dojo and they are not paying me to blog about this program. I just love it and wanted to share it with all of my teacher friends :) Have a great week everybody! I just found your blog, and I'm your newest follower. I used Class Dojo for the first time this last year. The kiddos loved it, and it was an awesome tool! I have taught third grade for 14 years, and will be moving to second grade next year. I'm really excited! HI!! I am so glad you posted about this. I remember checking it out at a conference last year and coming back and setting it up, but I didn't really use it. I love that it keeps the positives and negatives. I can't wait to try it this year. Thanks so much for reminding me about it. Oh my goodness! I LOVE the Dojo! I found it last year and got just about the entire school hooked on it. Funny thing I even had a couple of students make one at home for their brothers and sisters....Ha Ha! What a nice attendance chart. Thanks SO much for that class tool! I have given you the Lovely Blog Award. Hop on over to my blog to check it out. 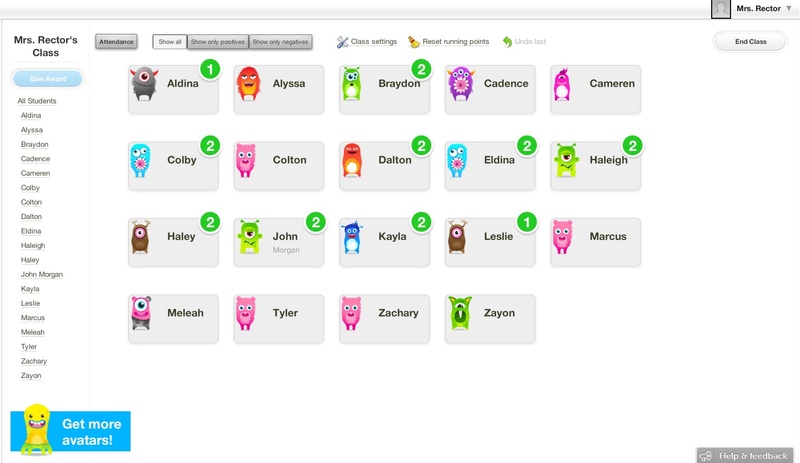 We used class dojo some last year and the kiddos loved it! We did it mostly as a fun classroom behavior management tool! The kiddos loved when their little monsters earned a point for good behavior! I am definitely going to check out the the ClassDojo! I keep hearing about this...I guess it is time for me to finally check it out! Thanks for sharing! I stumbled upon Class Dojo this summer and blogged about it here. Even though you posted this earlier this summer, I hope you'll consider linking up and sharing your post some more! I am so glad that I clicked on the tag of "behavior management"! I think that I am in love with this web app! It looks so fun and useful. Have you tried using it with parents? Such as, "Maybe Little Johnny is getting poor grades because he is last in the class for good behavior. Maybe you guys can work with him on appropriate behavior at home and I can reinforce it in class?" I think this has the potential for great parent-teacher usage. I am currently a college student, and I am trying to gather useful tools for once I begin teaching. I teach 8th grade and I wonder if this will work for them. At my old school we used Kickboard which tracked behavior (positive and negative) attendance and grades. I'm not sure if my new school has anything in place but I want to be proepsred in case they don't.